In the 1990s, Peter joined alto saxophonist Lou Donaldson's group and took part in four recordings with him. Bernstein's trio with organist Larry Goldings and drummer Bill Stewart was called “the best organ trio of the last decade” by the New York Times. Together they recorded a dozen of records exploring the depths of jazz standards or their original compositions. Mr. Bernstein has gone on to collaborate with Joshua Redman, Diana Krall, Dr. Lonnie Smith, Melvin Rhyne, Sonny Rollins, David Fathead Newman and Nicholas Payton. 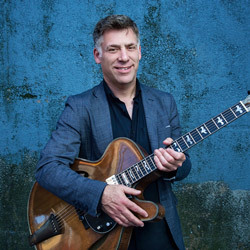 Tonight he is joined by his good friend Steve Masakowski, New Orleans premier jazz guitarist, who has played in the respected Astral Project for over thirty years and is Chairman of the University of New Orleans Jazz Studies Program.